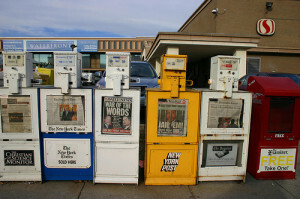 Whether it’s scaling back on daily print publication, increasing online presence, erecting paywalls, relying on user-generated content, or going “digital first” full-on, Journalism Formerly Known As Print is just really trying to survive. For a media company to declare itself digital first is mostly a matter of emphasis. Most simply, we feel we can better serve our various audiences on electronic platforms: we can do smarter and link-y journalism, design more beautiful and interactive experiences, and create higher-value and unique advertising opportunities for agencies and their clients. For us, digital first is a mode of being that promotes innovation and excellence. Pontin also recalls that the early experiments with “all or nothing” paywalls by some print publications had brought “disastrous results.” However, “porous paywalls,” he says, have worked well for such publications as The New York Times and the Financial Times. Pontin also notes that while it worked for The New York Times and Financial Times, it hasn’t for his publication. “My working hypothesis about why our porous paywall failed? We don’t publish so much that a threshold irritates enough readers,” he says. Paywalls, no matter how elegantly devised, have for me the smell of paper and ink, as if publishers were trying to revive a subscription business irremediably tied to the distribution of physical products. We want something more innovative and natively digital: a true electronic homologue to the old circulation business that will enhance readers’ interactions with Technology Review. We’re uninterested in one idea frequently packed inside the words: that digital-first publishers should throw open their editorial pages to so-called content from a ragbag of constituents, including nonwriters and marketers. Bottom line is, publications do whatever it takes to survive. Studies have proven that readers would turn to free alternatives before they pay for their news, on tablets and other reading devices. The demise (in May) of paywall and news aggregation site, Ongo, after only 16 months, also shows that readers may not necessarily want to get their news from aggregation sites. This only goes to show that we have only seen the beginning of print pubs embracing paywalls and “digital first” tactics, on many levels and with various shades of success. To what extent print journalism will evolve remains to be seen, of course, but it doesn’t have a choice but to go digital first, second, or, third. Image by Elvert Barnes, used under its Creative Commons license.